With a stay at Skene House Hotels - Holburn, you'll be centrally located in Aberdeen, a 4-minute drive from His Majesty's Theatre and 7 minutes from Robert Gordon University. This 4-star aparthotel is 1.7 mi (2.7 km) from Union Square Shopping Centre and 1.9 mi (3 km) from Aberdeen Royal Infirmary. Park Inn by Radisson Aberdeen is in the heart of the city centre, just off Union Street and towards the cosmopolitan west end of the city. The hotel is the perfect home base for exploring the Grampian Whisky and Castle trail. It offers modern air-conditioned rooms, free Wi-Fi, a fully equipped fitness centre, business lounge, 8 meeting rooms and a stylish restaurant and bar. Parking is also available next to the hotel and on the street. Rooms are stylish, colourful and comfortable, many with views of the city centre. The 185 rooms feature modern bathrooms, Smart TV's and a room service menu until 21.30. With a vibrant and warm atmosphere, RBG bar & grill serves an international menu with delicious classic fare and appetising dishes. Guests can enjoy a cocktail at the bar or choose another beverage from the extensive drinks menu. The hotel is conveniently located within walking distance of the shopping / business districts and is nearby transport links and motorways. Aberdeen train and bus stations are only a 10 minute walk away and the hotel is close to Aberdeen Harbour and Ferry Terminals. Guests can enjoy close proximity to sights like Balmoral Castle and the Malt Whisky Trail - a fantastic day out. A stay at The Craibstone Suites places you in the heart of Aberdeen, within a 15-minute walk of His Majesty's Theatre and Union Square Shopping Centre. This 4-star aparthotel is 1.9 mi (3.1 km) from Aberdeen Royal Infirmary and 2.6 mi (4.2 km) from Robert Gordon University. The Copthorne Hotel Aberdeen is one of the finest hotels in Aberdeen. With its granite facade, it is also one of the most charming hotels in Aberdeen and adds contemporary comforts and modern amenities to its charm. 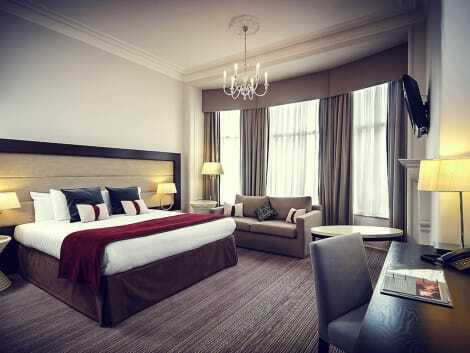 Housed within an historic stone building that’s very much in keeping with the “Granite city”, the 4-star Copthorne Hotel Aberdeen sits in a quiet part of the city, but is just a shortwalk from the train station and city centre. The hotel provides easy access to the city's venues and attractions, as well as to the tranquil countryside of North East Scotland, which hosts a selection of some of the finest whisky distilleries and castles in Scotland. The on-site West End Bistro serves great Scottish and international cuisine using locally sourced ingredients, and the cosy bar has an extensive drinks menu, including a selection of champagnes and cocktails. Classically elegant, the hotel’s rooms have flat-screen TVs with satellite channels plus tea and coffee making facilities. With a stay at Skene House Hotels - Rosemount, you'll be centrally located in Aberdeen, a 3-minute drive from His Majesty's Theatre and 7 minutes from Aberdeen Royal Infirmary. This 4-star aparthotel is 1.3 mi (2.2 km) from Union Square Shopping Centre and 2.3 mi (3.7 km) from University of Aberdeen.